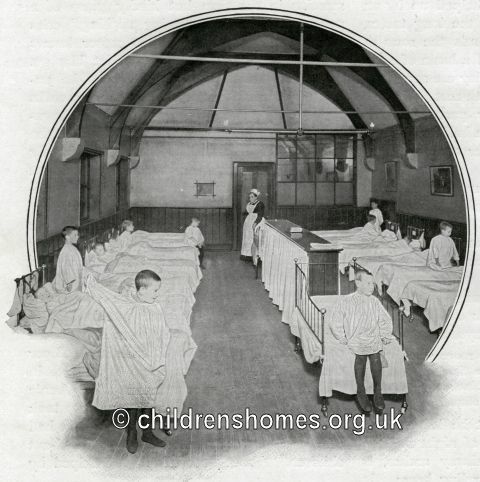 The Alexandra Orphanage for Infants was founded in 1864 following a proposal by Frederick Barlow, treasurer of Orphan Working School at Hampstead. He offered the rent-free use of a house in London together with an annual donation towards its running costs. Following other contributions, the Orphanage admitted its first twelve children on March 23rd, 1865. The institution accepted orphan children from earliest infancy to five years of age and educated them until eight years of age. By May, 1866, there were 24 children in residence. Plans were soon being made for larger purpose-built premises. 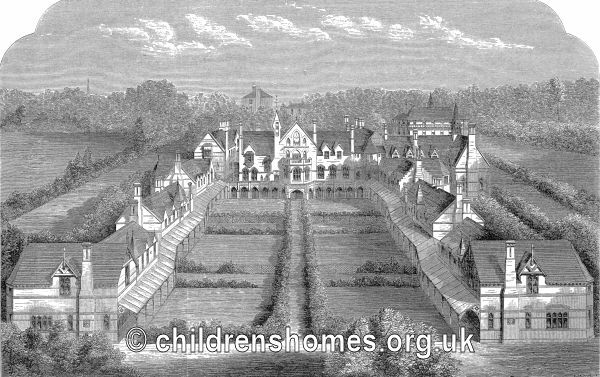 The design adopted featured a central building around which there were to be up to sixteen separate houses each holding a 'family' of 25 to 30 infants. The building was possibly the first in England to be built on the family group or cottage home principle which had been pioneered by some institutions in Europe. Construction work began in 1867 on the new buildings at Hazelville Road, Hornsey Rise, in north London. The complete scheme would accommodate 370 children up to the age of ten. 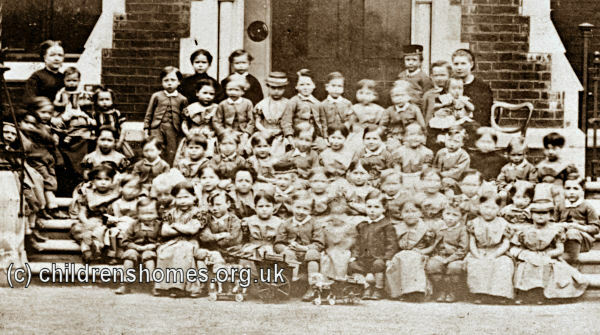 The Orphanage moved into its new premises in February 1869, with 100 children in residence by 1870. Although accommodation was available for 100 more, the places were not filled due to shortage of money for the running costs. The new building, designed by Messrs Habershon and Pite, is shown in the illustration below. The plans included additional cottage blocks to the south-east of the site (nearest the viewer in the illustration) which were never erected due to lack of funds. 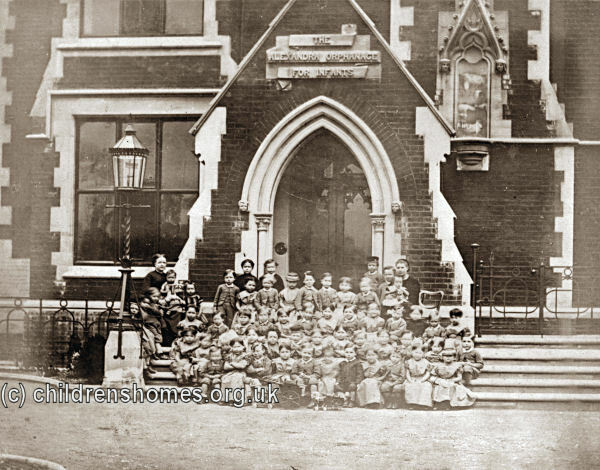 In 1876, the Orphanage amalgamated with the Orphan Working School based at Maitland Park, Hampstead, and became the junior department of the new 'Orphan Working School and Alexandra Orphanage'. The new institution could house a total of almost 550 children ranging in age from infancy to 14 years. Admission was by election of the charity's subscribers in January and July or by 'presentation', i.e. purchase, with the amount ranging (in 1890) from £120 to £220 depending on the age of the child. Children were admitted from infancy up to 11 years of age. Candidates had to be be nominated by a Governor and to provide certificates of parents' marriage, of birth, of health, and of a guarantee for removal from the School in due course. As a rule, no child was admitted whose parents had received poor relief. Three of one family could not be in the institution at once, nor two stand at same election. Inmates had to be provided with certain specified clothing on their admission. In 1879, additional accommodation was erected at Maitland Park for the use of the Alexandra Orphanage which eventually vacated the Hornsey Rise site in 1905 — the buildings were then used as a workhouse by the Shoreditch Board of Guardians. The Hornsey Rise buildings no longer survive. Surrey History Centre, 130 Goldsworth Road, Woking, Surrey GU21 6ND. Holds the archives of the Orphan Working School, Alexandra Orphanage, Royal Albert Orphan Asylum, and Royal Alexandra School. Pupil records include Admission registers, School ledgers, Examination books, Medical records, Address books, Attendance records, etc. An online catalogue is available. A 100-year closure restriction applies to some records. London Metropolitan Archives, 40 Northampton Road, London EC1R OHB. (The Ancestry website also has LMA records relating to workhouses and other institutions — more details.) Hold some correspondence and papers (1882-1959).